By 1460 she had been deposed by her half-brother, Giacomo, who had himself crowned in her place. In an effort to gain support for his rule, the new king of Cyprus sought a political alliance through marriage and, turning to the republic of Venice, requested a bride. 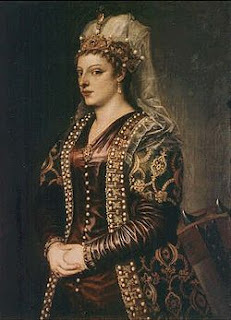 In response, the signory selected Caterina Cornaro, the daughter of Fiorenza Crispo and Marco Cornaro, who, interestingly, "happened to hold most of the island of Cyprus in mortgage." 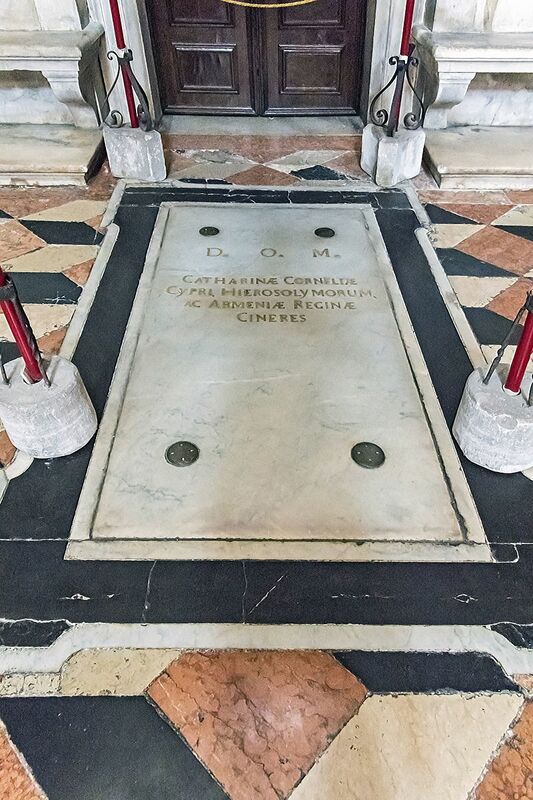 On 30 July 1468 the betrothal of the fourteen-year-old Caterina to Giacomo was celebrated by proxy in Venice. But Caterina did not travel immediately to Cyprus to meet her new husband; instead, she remained in Venice for four years more years. In the mean time, Giacomo seems to have considered carefully other possible marital alliances, most notably the suggestion of Ferdinand of Naples that the king of Cyprus marry his daughter, but Giacomo hesitated and was eventually persuaded to accept the marriage he had already negotiated. In 1472 Caterina finally left for Cyprus, where her marriage to Giacomo was formalized. Within the year he died, leaving his wife, then pregnant, to succeed him. Immediately after her husband's death, Caterina acted to preserve Cyprus for her unborn child. A regency council was established, and Caterina, recognizing that "her throne was on a volcano" (stava apicato a un chavelo), sent word of Giacomo's death to Venice, which responded by sending troops to Cyprus to protect the young queen. Meanwhile, on learning of the situation in Cyprus, Carlotta of Lusignan, who had taken refuge in Rome after Giacomo's usurpation, prepared to reassert her claim to the throne. Her supporters forced their way into the Lusignan palace, killing several members of Caterina's household, including her uncle and cousin, but the queen herself escaped. When Venetian troops arrived, the conspirators were hunted down and order was restored. On 28 August 1473, the queen of Cyprus gave birth to a son, who was baptized Giacomo III on 26 September 1473. But the son for whom Caterina struggled to preserve the crown of Cyprus died in 1474, just a year old, and once again Carlotta of Lusignan conspired to effect her rival's overthrow, this time with the aid of Ferdinand of Naples. In response, the republic of Venice sent Caterina's father and mother to Cyprus and ordered that Giacomo's mother, sister, and illegitimate son be sent to Venice. Denied motherhood, Caterina seems to have turned her energies to sovereignty, supported by her subjects: she "recalled to [them] those memories of independence which flattered their pride," a contemporary commented. The counselors and commissioners sent from Venice inexorably assumed more and more power in Cyprus. Caterina protested to the doge, complaining, for example, that one of the Venetian envoys "without respect or reverence would enter her chamber when he would." Even her brother was won over by those who sought to relieve Caterina of her crown; pressure was exerted to convince her that the best course of action for her was to abdicate. Finally, in 1489, "the unhappy lady yielded . . . to persuasion and threats." Her decision to abdicate her throne was described by a Venetian ambassador as having been made as a result of "full and free determination." She returned to Venice and was "freed" from the rule of Cyprus in a formal ceremony; in return, she was awarded the castle and town of Asolo. She took possession of her new "kingdom" on 11 October 1489. "We cannot tell whether the exiled Queen of Cyprus was really satisfied with her mimic Court, her empty title," muses historian Marian Andrews, "or whether, like a wise woman, she made the best of that which was within her reach, and ceased to sigh for the unattainable." What we do know is that she governed Asolo efficiently for nearly twenty years. Though her "kingdom" was limited, Caterina Cornaro dispensed justice, founded charitable institutions, patronized artists, welcomed intellectuals, and was loved by her "subjects." At last, when the combined forces of the Holy Roman Empire, France, and Spain invaded Italy and threatened Asolo, she was forced to return to Venice. She died there on 10 July 1510 and was buried the next day in the Cornaro chapel. *This essay has been adapted from The Monstrous Regiment of Women: Female Rulers in Early Modern Europe.